At the end of the Reagan era, many in the U.S. Air Force began to express their concerns about the health of their institution. They questioned whether the Air Force had lost its sense of direction, its confidence, its values, even its future. For some, these concerns reflected nothing more than the maturation of the most youthful of America's military institutions. 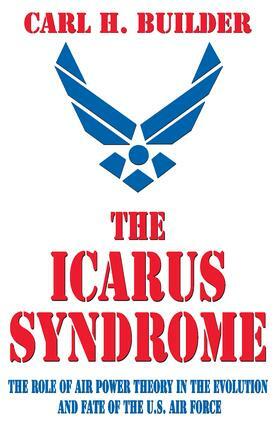 For others it was a crisis of spirit that threatened the hard-won independence of the Air Force. Although the diagnoses for this malaise are as numerous as its symptoms, The Icarus Syndrome points a finger at the abandonment of air power theory sometime in the late 1950s to early 1960s as the single, taproot cause of the problems. That provocative diagnosis is followed by an equally provocative prescription the Air Force must follow to regain its institutional health. Author Carl H. Builder begins with an overview of this crisis of values within the Air Force, along with a litany of concerns about what seems to have gone wrong within that institution. The history of the U.S. Air Force, along with the role played in it by air power theory, is explored and is used to support Builder's thesis. The remainder of the book is an analysis of what went wrong and when, how these wrongs might be corrected, and the challenges for Air Force leadership in the future. Now available in paperback, The Icarus Syndrome will be of great interest to U.S. Air Force professionals, military and aviation historians, and institutional psychologists.